Fragrant, 6 in. flowers make a big impact all summer long in window boxes, containers, hanging baskets and front borders. Flowers range from delicate pastel hues to deep, rich shades, and are accented by the broad, attractive foliage. The Giant Camellia Begonias, or Rose-Form Begonias, are the most spectacular of all the begonias. 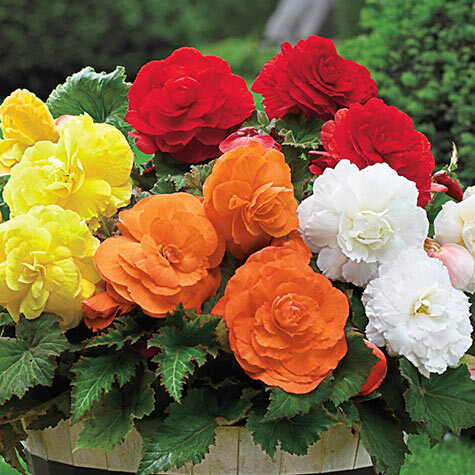 The ruffled , colorful flowers are a great way to brighten shaded porches, decks and gardens. To produce blooms up to 6" across, pinch off the side buds. Lift in fall. Grows 10-12 in. tall. Prefers shade to partial shade. Lift in fall. 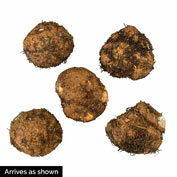 6+ cm bulbs. Zones 9-10. Depth: 1 inch. Plant with the concave side facing up. Color: Mixed colors from pastel to deep rich shades. Foliage: Medium green fleshy leaves with serrated edges. Blooms: All summer until frost. Flower Form: Fragrant 6 inch flowers. Size: Fragrant 6 inch flowers. 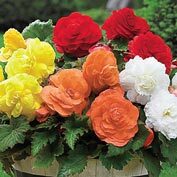 Comments: Most spectacular of all begonias. Flowers range from delicate pastel hues to deep, rich shades.